This fourth topic explores some of the drivers behind flexible and mobile learning as well as what flexibility entails for both students and educators. The 21st century has seen a change in student demographics. The student body is increasingly diverse, for example – since many students are learners who may have work and family schedules in addition to study commitments, attending traditional face-to-face classes in a college or university may not always be possible. Ubiquitous networked computer technology, the growth of the Internet and the widely used personalized technologies as well as social media provide multiple platforms for cooperation and co-learning. This has given rise to added opportunities for both students and educators, in a time of increasing uncertainty in the educational landscape. You will be encouraged to reflect on possible challenges and opportunities that flexibility has for learning and education in general, from an individual as well as collaborative and organizational perspectives. Mobile learning, on the other hand, is more than just using a mobile device to communicate with others or to access course content – it is about the mobility of the learner, the fact that learners nowadays are mobile. Reaching a concensus about what mobile learning really is has been very hard, because of the rapid evolution in this field, but also because mobile learning seems to work best when it is part of something else. Check out the suggested video resource (at the end of this page) by Alastair Creelman as well as the readings on Flexible and Mobile Learning (you may also conduct your own search and share resources you find useful). Discuss aspects of Flexible and Mobile Learning in your professional context with peers and comment on each other’s contributions. On Thursday 22 Oct CEST 19:00–20:00 (7-8 pm) there will be a flipped webinar based on Jonas Månsson lecture on the topic for this week. Jonas is associate professor of mathematics at LTH (Lund University School of Engineering) in Lund. He got an award for best teaching practices last year. Here’s his blog and his YouTube Channel. Reflect on how and why you would enable elements of flexible and mobile learning. What is your target group of students like? How do you use your learning spaces, virtual as well as on campus? Are there opportunities for further development in this area you have now identified as a result of your engagement in this topic? Comment and invite others to comment on your learning blog post. Study one of the scenarios below: start to reflect individually and then share with your group. 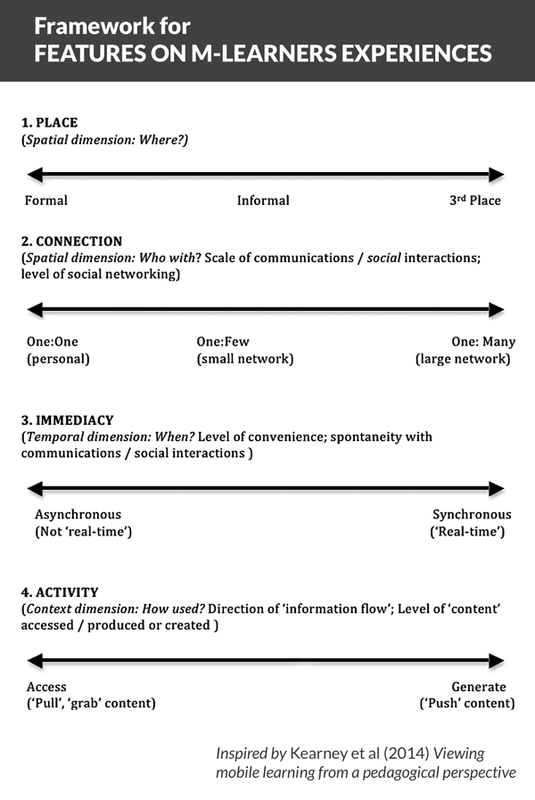 Investigate the scenario together: consider using the FISh framework and adapt as suits the group. 2. Hrastinski, S. (2008). Asynchronous and synchronous e-learning. Educause quarterly, 31(4), 51-55. Available here. 3. Kearney, M., Schuck, S., Burden, K., & Aubusson, P. (2012). Viewing mobile learning from a pedagogical perspective. Research in Learning Technology, 20. Available here. 4. New Media Consortium, & EDUCAUSE Learning Initiative. (2012). NMC Horizon Report: 2012 Higher Education Edition. See especially the chapter about Bring your own device (BYODL). Available here.